TO COMPLETE MY TASK THAT’S ALL I ASK. THEY CAN RESPECT GOD’S CREATIONS ONE AND ALL. PLEASE READ THIS APPEAL TO HELP NOT ONLY THE PRIMATES BUT ALSO THE OTHERS WE CARE FOR AT A.P.E.S. We unfortunately have to move from here due to human expansion this being due to the unfortunate death of our previous Chief Mbolongeni Zondi, who was murdered 6 years ago, since then due to corruption by certain Trust members plots have been sold illegally to mainly non beneficiaries and the communities etc involved have not benefited financially either. Now a huge problem has accrued, instead of only 16 dwellings there are over 90 and still expanding this is fast becoming a “danger zone” not only for the primates but other wildlife as well. We have been granted permission and we do have a legal document to prove this, that we can now occupy the above mentioned property. Unfortunately due to the time lapse corruption etc as it has taken 4 years to get this far the property, has had the misfortune of being partially vandalized, and needs funds/certain materials etc to make the house livable and to restore some of the out buildings, fencing etc. Therefore we appeal to you for your help please. Furthermore, if we do not move it will mean that we might have to have the primates in our care destroyed, as they cannot continue to be on this property as explained previously. I would also like to add that there is a small primary school on the property and as I am a nursery school teacher I will be assisting.They too have suffered due to vandalism; a vital necessity is the water, not only for drinking but sanitation as well. The water pumps etc have been stolen the teacher brings water in a container for the children There is no electricity either due to certain cables etc that have also been vandalized. The following is desperately needed I can on request also supply the Project Proposal that we originally supplied to the community authorities of the area. Further more we are still prepared to implement the projects that are listed. Water pumps to supply water to the main house. & school Electric light fittings, and wiring, plug boxes and switches. Waterproofing compounds for steel roofs. Fencing wire Paints and varnishes for interior and exterior. Doors, handles, locks fittings etc. If you would like to see the full list of the damage and assist with anything at all we will gladly foreword it to you. Bank details are on our website www.apes.org.za for any financial help. Thank you for taking the time and trouble to read this appeal. Bless you for caring. We at APES appeal to all those people out there that care….It is doubtful if any animal organization world wide, is financially strong at all times. APES is amongst those that survive solely on donations and from our volunteer programme. 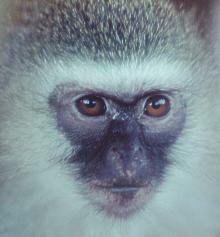 For us to continue our work with the animals (mainly Vervet monkeys) we appeal to you for your support in our most serious time of need since our inception thirteen years ago. For the sake of our beloved Vervet monkeys please think about us and help save not only our wildlife but also our community related self help upliftment programmes and environmental education for the benefit of our rural people. We would also welcome any queries regarding our work at the sanctuary. Thank you for taking the time to read this appeal. For the day to day running expenses of the sanctuary - food, medicines, maintenance and administration. Materials and equipment to maintain the sanctuary, like fridges, fencing, poles, shade cloth, food and food containers, steel tables, old bedding, telescopic ladders, computer consumables etc. Long term sponsorship of an adequate property and term grants will enable us to establish a basic infrastructure to support the existing demand for our services and hopefully be in a better position to meet the ever increasing demand. This is critical to the future of Kwazulu Natal’s Vervets as existing Government and NGO services are inadequate.